Join us to elect Sara as Vermont State Rep. for Vernon & Guilford! "Sara cares deeply about Guilford and Vernon, the people who live here, and the traditions of our farming families. She’ll bring innovative ideas to the legislature, ask hard questions, listen to her constituents, and make good choices on our behalf." See Heather's letter to the editor here. See Anne's letter to the editor here. See Andy's letter to the editor here. "As a mom, small business founder and owner, and a very active community member, Sara has demonstrated that she can effectively balance concern for meeting people's needs while being financially responsible. That's a very tough balancing act, one which requires skill, commitment, and hard work. As an independent voter, I try hard to assess the candidates I vote for, not based on their affiliations but rather, on their demonstrated abilities and accomplishments. Sara has everything I look for in a State Representative." See Mike's letter to the editor here. "Sara has a strong determination to bring communities together as well as the prowess needed to invigorate community members to create dialogue about the issues that matter most to them. She has a proven track record of being significantly involved in her community; she makes plans, puts them into motion, and makes things happen. We need this energy and motivation in politics at all levels." See Nader's letter to the editor here. "Sara has a vision for helping Vernon and Guilford move forward. While understanding the practicalities our rural towns face, she has a gift for seeing the possibilities. She is exceptionally good at connecting people and ideas to achieve results. 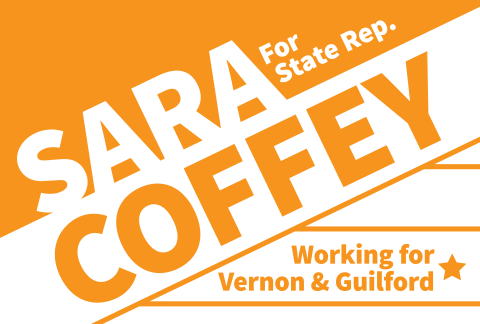 With experience, character, and vision, Sara is the individual that Vernon and Guilford need representing us in Montpelier. " See John's letter to the editor here. "Sara will work tirelessly to support healthy communities statewide, build bridges and affordability, and grow our economic engine to enable a more equitable, just and robust Vermont." "My experience working with Sara is that she has a great respect for the rural essence of Vermont and she possesses the ability to step back, look at a challenge, discuss issues with people with a variety of viewpoints, and work collaboratively on a solution." "I have worked extensively with Sara on Guilford projects, ranging from the 250th Anniversary Celebration, to Grange events, to the Broad Brook Community Center, which she serves as President, and I am always impressed by her skills, level of commitment, and fairness in all that she takes on." See Don's letter to the editor here: https://www.reformer.com/stories/letter-support-for-coffey,554762? "Sara brings the same qualities — dedication, humor, curiosity, stamina, and humility — to all she does. Her interest is authentic; she listens to everyone and respects differences. Sara is excited about serving both Guilford and Vernon, exploring and expanding our common interests." See Verandah's letter to the editor here: https://www.reformer.com/stories/letter-support-for-coffey,554764? "Not only does Sara have the vision to conceive inspired community partnerships, but she also possesses the skills and tenacity to implement complex projects. Sara is the quintessential social entrepreneur who leverages her professional abilities for the public good." See Konstantin's letter to the editor here: https://www.reformer.com/stories/letter-coffeys-energy-innovation-needed-in-legislature,554919? "Sara Coffey is an outstanding community leader who builds coalitions making everyone eager to participate and always feel rewarded by their participation. Sara's work has advanced the creative economy in Vermont and we all recognize how important this is for economic growth in our region." See Erin's letter to the editor here: https://www.reformer.com/stories/letter-coffey-is-an-outstanding-community-leader,555073? Windham-1 needs someone who cares passionately about the district, who will bring fresh ideas to Montpelier, and who has the track record of getting people to talk to each other. Sara Coffey has that experience, both professionally and as a member of her community. See Ian's letter to the editor here: https://www.reformer.com/stories/letter-support-coffey-for-windham-1,555208? We are casting our vote for Sara Coffey as we are impressed by her business acumen, her community involvement in Guilford as well as her sincere interest in generating employment opportunities in Vernon and Guilford. Sara is a coalition builder but will stand her ground when necessary as she has the courage of her convictions. Sara Coffey’s life experience will serve Vernon and Guilford well in Montpelier. See Eddie & Lynda's letter to the editor here: https://www.reformer.com/stories/letter-choosing-sara-coffey-for-windham-1,555205? See Libby's letter to the editor here: https://www.reformer.com/stories/letter-support-for-coffey,555262? Sara is committed to efforts that invest in high quality public education, including funding and policies that provide more affordable options for early childhood education. There is no doubt that Sara will support innovation in our schools and help find creative solutions and flexible approaches to managing change, something that will help ensure our schools can continue to be important centers of our communities. See Emma's letter to the editor here: https://www.reformer.com/stories/letter-support-for-coffey,555257?